Lake of Bays - patio and deck at waters edge, sun all day from 11:00 AM. 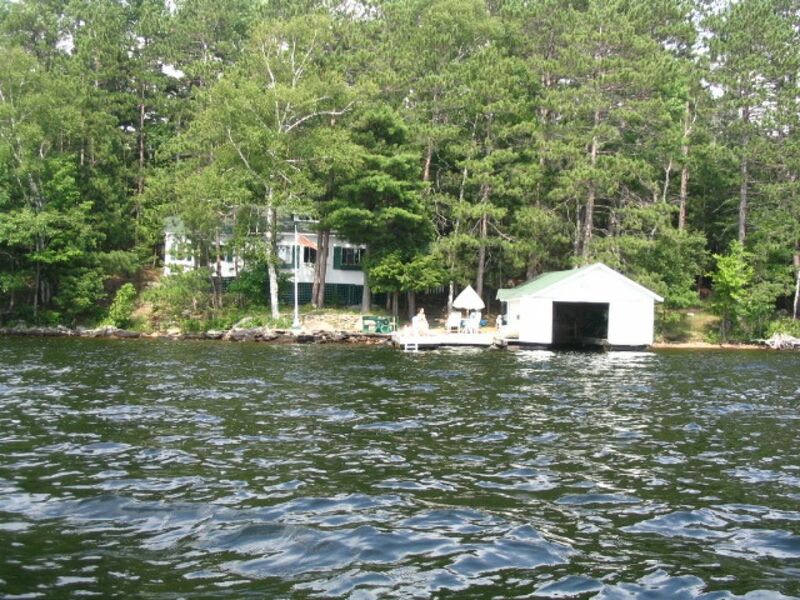 Nice family cottage near Algonquin Park- pretty, private, fully equipped, 4 bedroom, lovely veranda, boathouse, deck, dock, BBQ, kayak, life preservers, hammock, tiki torches, clear water, great SW view, sun from 11 AM. King, queen, 4 twins. Parking for 3 cars plus boat trailer, , 1 week minimum, prime time available. Also available - cottage next door (we own). Public beach and boat launch 5 miles away in town of Dwight Ontario. Free firewood, and spring drinking water Perfect!. Check out pics. No smoking in or out. Boat rentals nearby and often they deliver. We don't have a fire pit due to frequent bans in Muskoka. This place is pretty and private. We will consider pets but we must first agree.